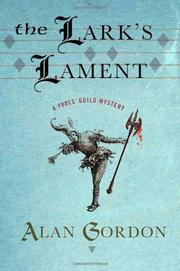 A family of medieval Fools must solve a murder to protect their Guild from the Pope’s wrath. Theophilos, his wife Claudia, their baby Portia and their apprentice Helga are visiting a Cistercian monastery to ask the abbot Folc, a former Guild member, to intercede with the Pope on the Guild’s behalf. Soon after their arrival, a monk is murdered and a cryptic message—“FOLQUET: COLD IS THE HAND THAT CRUSHES THE LARK”—written on the wall in his blood. The abbot agrees to plead the Guild’s case with the Pope if they can identify the murderer. Looking into Folc’s past life, the Fools discover that he was a talented minstrel and a married man with a wandering eye. They travel to interview Folc’s wife, who entered a religious order, then to Marseille, where Pantalan, the local Guild member, helps them dig into Folc’s activities, both personal and political, and recalls that the bloody epitaph is from a song. The Fools’ search leads to Montpellier, where the languishing local Fool has been banned from the palace. They realize they’ve touched a nerve when dead bodies start to pile up. Only the mental and physical gifts they’ve cultivated as Fools save them from joining the ranks of the dead before they can uncover the truth. An intriguing look at the world of the Fools Guild in 1204 that works much better as history than mystery.